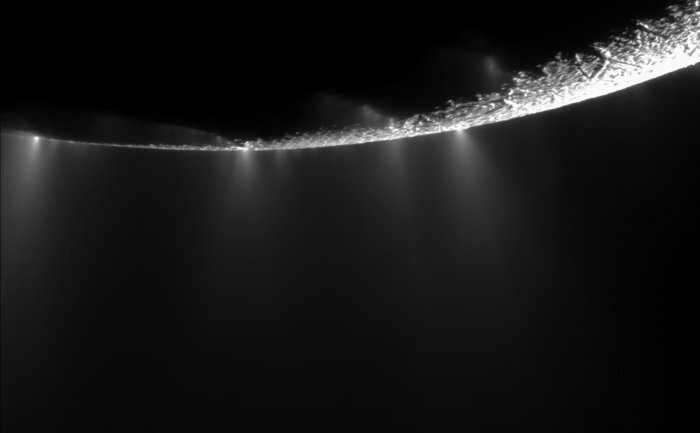 Tiny grains of rock detected by the international Cassini spacecraft orbiting Saturn point to hydrothermal activity on the seafloor of its icy moon Enceladus. The finding adds to the tantalising possibility that the moon could contain environments suitable for living organisms. Understanding the interior structure of 500 km-diameter Enceladus has been a top priority of the Cassini mission since plumes of ice and water vapour were discovered jetting from fractures at the moon’s south pole in 2005. Ice particles in the plumes were found to be rich in sodium salt, implying that the water has been in contact with rock, and subsequent measurements of the moon’s gravitational field revealed a 10 km deep subsurface ocean at the south pole, below a 30–40 km thick ice crust. 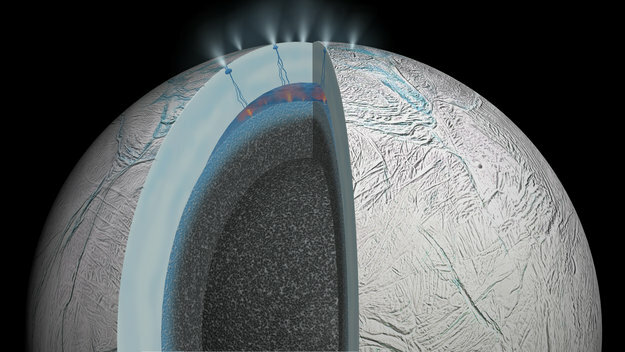 Now, following an extensive, four-year study of data from the spacecraft, combined with computer simulations and laboratory experiments, scientists have been able to gain deeper insights into the chemical reactions taking place on the floor at the base of Enceladus’s ocean. Using Cassini’s Cosmic Dust Analyser, scientists have discovered a population of tiny dust grains, just 2–8 nm in radius, in orbit around Saturn. They are rich in silicon, marking them out from the water-ice particles that dominate in the planet’s environment, including in its famous ring system. They believe that these silicon-rich grains originate on the seafloor of Enceladus, where hydrothermal processes are at work. On the seafloor, hot water at a temperature of at least 90 degrees Celsius dissolves minerals from the moon’s rocky interior. The origin of this energy is not well understood, but likely includes a combination of tidal heating as Enceladus orbits Saturn, radioactive decay in the core and chemical reactions. As the hot water travels upward, it comes into contact with cooler water, causing the minerals to condense out and form nano-grains of ‘silica’ floating in the water. To avoid growing too large, these silica grains must spend a few months to several years at most rising from the seafloor to the surface of the ocean, before being incorporated into larger ice grains in the vents that connect the ocean to the surface of Enceladus. After being ejected into space via the moon’s geysers, the ice grains erode, liberating the tiny rocky inclusions subsequently detected by Cassini. “It’s very exciting that we can use these tiny grains of rock, spewed into space by geysers, to tell us about conditions on – and beneath – the ocean floor of an icy moon,” says Sean Hsu, a postdoctoral researcher at the University of Colorado at Boulder and lead author on the paper published today in the journal Nature. On Earth, grains of silica are found in sand and the mineral quartz. The most common way to form small silica grains is through hydrothermal activity involving a specific range of conditions. In particular, such grains form when slightly alkaline water with modest salt content and super-saturated with silica undergoes a big drop in temperature. “We methodically searched for alternative explanations for the nanosilica grains, but every new result pointed to a single, most likely origin,” says Frank Postberg, a Cassini Cosmic Dust Analyser scientist at the University of Heidelberg in Germany, and a co-author on the paper.